Reading for the delightful BookiesToo reading group and I really didn’t expect to like it until someone described it and recommended it. I do enjoy good science fiction of various sorts – future worlds and dystopias, techno stuff. In Station Eleven I read about a Shakespearian company traveling through a sparkly populated countryside twenty years after the entire world had been devastated by a virus. The characters and the reader wondered what was going on in the rest of the world. The situation in The Dog Stars might be the answer although the question of how the whole infrastructure fell apart due to a virus is left unanswered. But this time life as we on earth know it ended nine years ago and the first sentence reads “In the beginning there was Fear.” A virus wiped out most of humanity and what is left is probably contagious. So Hig, our first person hero, lives with his dog in an abandoned airport hangar in Colorado – or what was Colorado. Hig lost his wife and child in the epidemic but with him now is his old dog, his “heart,” named Jaspar, and together they fish and hunt and scavenge for food. They sometimes take a flight around to patrol the area in an old Cessna. Hig and Jason have a neighbor named Bangley who is a curmudgeonly survivalist and would rather kill you than even anywhere risk getting ill – shoot first ask questions later would seem a good motto for him. But their relationship is complex. The main theme is grief and loss, but that’s alternated with page-turning, heart-pounding suspense and doing what you have to do to survive. He meditates on loss and grief and the natural surroundings. The structure is refreshingly straightforward and linear – Hig and other characters remember a few things from before and during the collapse – but there’s no backstory stuff or alternating time frames. 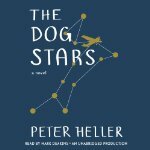 The writing is absolutely gorgeous, the insights flowing and seemingly inevitable and I love the way Hig talks to the dog and himself as he wanders around, doing his things, exploring his territory. I did enjoy the book even though there’s a certain clichéd business to the general ideas – the world has ended in utter catastrophe, there’s sexual passion along with intense violence. I think the characters really carry it although it’s certainly not what I’d consider character-driven.